Microphone type and microphone placement is crucial for the amplification of musical instruments. In her works Kropka Na Ogonie (2016) and Soroka Fruwa (2016), Aurélie Nyirabikali Lierman gives a fascinating example of how this microphone choice and placement can become a compositional parameter and a substantial characteristic of the work. Aurélie calls these pieces a miniature musical theatre performance in two acts: the score’s instrumentation lists a single metal wire brush as a beater and the air around the performer’s torso as the percussion membrane, amplified by microphones. 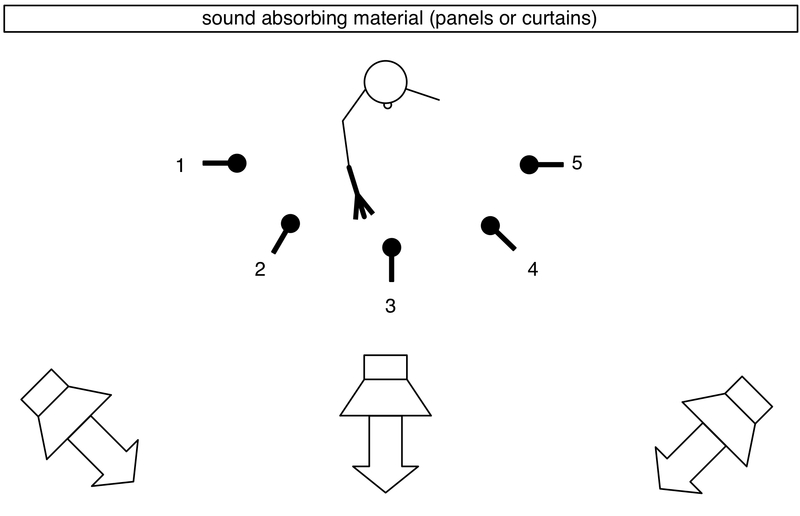 In the second act the performer’s voice is added, but also here, the sounds are kept to a very low amount of action: only the (un)voiced breath and mouth and throat sounds of the performer are used. 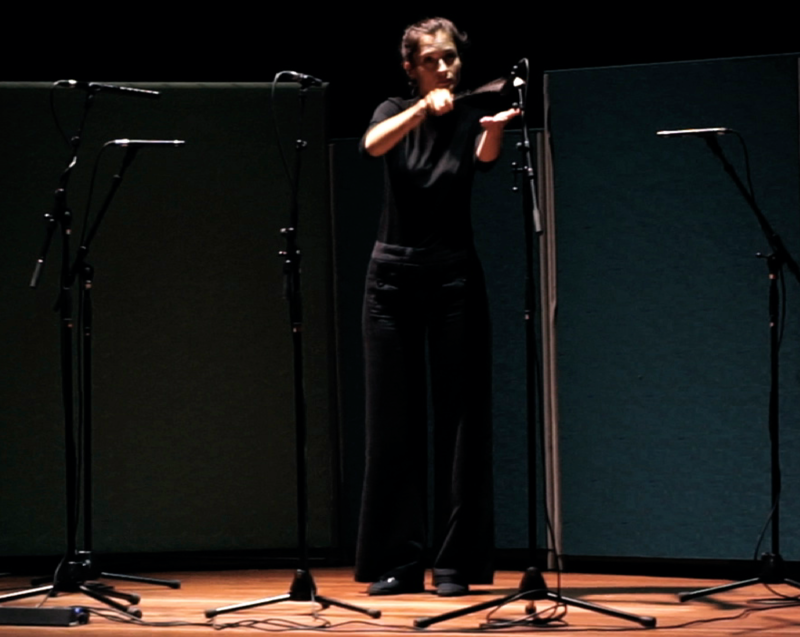 Hearing and seeing this performance by Marianna Soroka reveals that the piece is not only a miniature, using a minimal amount of sonic material, but at the same time also an enormous magnification: the performance is based on the extreme amplification of very large letters, written with big gestures in the air. The most conspicuous visual and audible element of the performance are the five large microphones placed in a semi-circle around the performer. Aurélie explained to me how she developed this piece. After many years of working a lot with voice and speech, as a radio producer and vocalist, she decided to integrate voice and speech in her work as a composer. In the talking drum from West Africa, she found an instrument that had a relation to sound similar to that of the human voice: it communicates (a kind of) language through sound. At times, the drum even appears to sound like human speech, but it can also produce abstract sound and therefore function in a rather musical context. The talking drum was the quickest way to communicate before the invention of western telegraphy, since messages transmitted by talking drums travel at a speed of 160 kilometers per hour. The talking drum is traditionally played with a wooden beater, but Aurélie tried out not only the traditional beater, but all kinds of others as well. Using a jazz brush to play a talking drum is—as she mentions herself—quite weird. But while doing this, she remarked that all sounds produced by the brush in the air before hitting the drum skin were even more interesting than the sound of hitting the drum. This is how her work on two new pieces for a single brush and hyper amplification— Kropka na Ogonie and Soroka Fruwa—started. The piece for talking drum became Tele Drumming (2016), a piece for percussionist “talking” through the drum, a text video and a recording of a Skype conversation with her brother. During Kropka na Ogonie (Polish for “dot on the tail”) the performer Marianna Soroka makes big gestures in the air with the brush, writing big letters in her mother tongue, Polish. There are many very specific alphabetic characters in Polish, each calling for their own unique pronunciation and orthography, and often with tails (see the score fragment above). 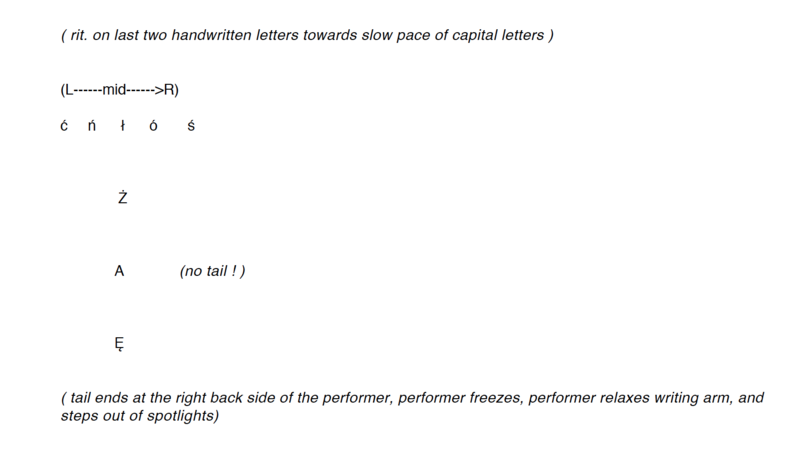 The visual reference to writing is enhanced by using just one brush, instead of two, which is common in percussion playing. The inspiration for these big gestures for drawing letters comes from graffiti and (Western and Eastern) calligraphy. Aurélie translates the visible appearance of these characters directly into sound instead of leaving a visual mark. At the start of the development of the piece, the sounds made by the brush in the air are amplified simply by two microphones. Pretty soon, a third is added to create a more detailed image of the audible movements. For the final result, five microphones are used. Aurélie mentions that technically speaking, two of these microphones (no. 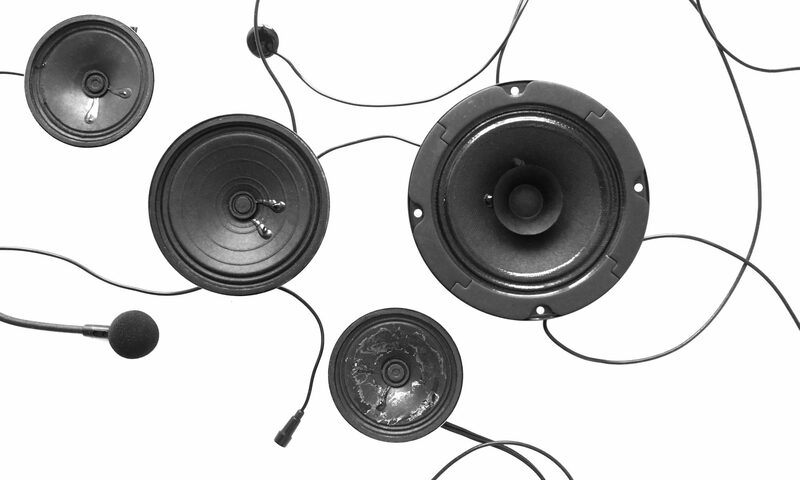 2 and 4; see set-up scheme above) are not strictly necessary for a suitable amplification of the sounds. But as soon as she leaves them out, the percussionist will tend to move less in between the three microphones left, since we tend to perform mainly in the area in front of the mike. The microphones used can be, for example, Neumann 184s, DPA 2011s, 4011s or also 4099s or ME66 Sennheisers. Sound absorbing materials, such as sound proofing panels or curtains, are used to dampen the space around the percussionist. Although the performance is very quiet by nature, Aurélie asks the performer to aspire to extreme dynamic contrasts at all times. The most astonishing aspect of this performance for me is the difference in character between the two performances. The second part of the performance is called Soroka Fruwa, based on the Polish words “Sroka Fruwa” and is a poetic way for saying “A Magpie is Fluttering” (Sroka was changed to Soroka, since the percussionist’s name is Marianna Soroka). This piece takes noises of the human child and bird wings as archetypes. When experimenting with the brush noises, some of the sounds reminded Aurélie of flapping bird wings. 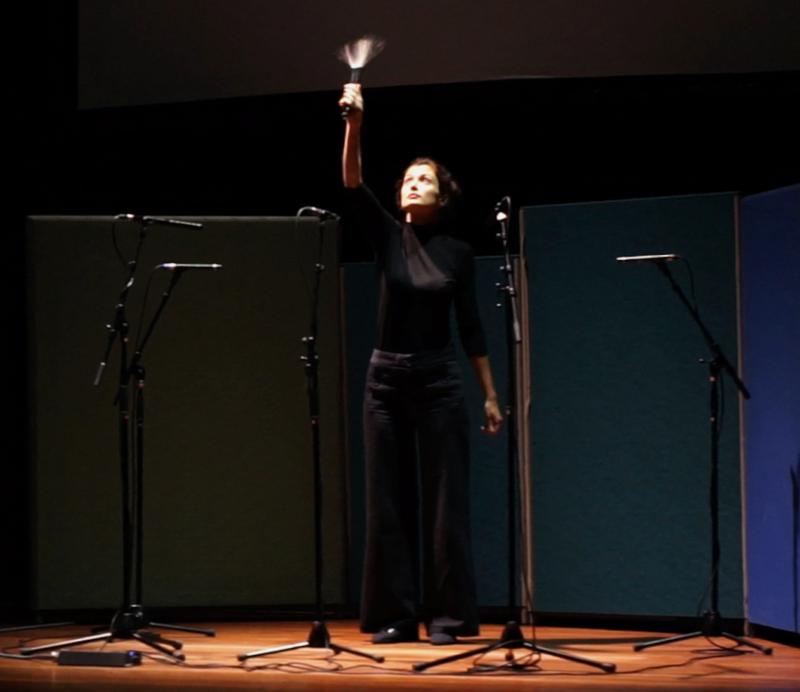 The brush and microphone amplification is used to create a foley of these sounds, evoking the flights of a night owl, a peace dove, an eagle, or other bird species. In this second part, our imagination is opened up to completely different associations, created once again with mikes, brushes, and gestures. Many thanks to Aurélie for the long conversation on her music!